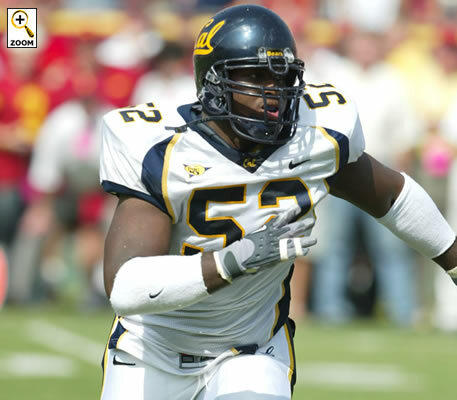 The Seahawks addressed their defensive line needs by selecting Cal tackle Brandon Mebane with their third round pick. This addresses an obvious weakness for the Hawks, who were paper thin at the position by the end of last year. The biggest downside, though, appears to be that at 6-foot-1 and 305, he's yet another smallish tackle on a team filled with them. That's not the Seahawks' fault; this was a draft bereft of defensive tackle depth, and they weren't likely to get one of those big space eaters in the second or third round, anyway. Here's the take on him from Scott Wright's Draft Countdown -- and, yes, if you think he sounds like a clone of every guy who plays DT for the Seahawks not named Marcus Tubbs ... well, you're not alone. Strengths: A solid athlete with good quickness and agility...A disruptive penetrator who will collapse the pocket and make a lot of plays in the backfield...Strong and stout at the point...Plays with good leverage...Flows to the ball, excels in pursuit and has a burst to close...Is very solidly built...Has a lot of playing experience and he was pretty productive...A hard worker with a tremendous motor and top intangibles. Weaknesses: Is undersized and does not have the height you would prefer...Needs to develop additional pass rush moves...Will struggle with blockers who are a lot bigger than him...Struggles to disengage at times...Overachiever who will find it's a different game in the pros...Can make better use his hands...Timed speed is only average. Pray that Tubbs comes back healthy from knee surgery. Otherwise, we're doomed to more Sundays watching Frank Gore and Stephen Jackson run roughshod over our small defensive front.